Our third attempt at observing this month was a success. We had 8 visitors during the 3 hours we were set up at Wellow and even though we had Moonlight and the prospect of the Sun only just below the Northern horizon, it was a treat. The skies started off with significant haze but this improved all through the evening until it was quite clear and even the disturbance close to the horizon had reduced sufficiently to get some sneaky views of certain objects rising. Given the extra light around this time of year, it was not going to be a monster deep sky, faint nebula night but the haul was more than sufficient to please young and old. We had 6 telescopes set up scanning the skies and a good deal of banter and sharing of tips and tricks. The evening kicked off observing the crescent Moon 25% illuminated off in the West. Not too much movement in the atmosphere meant craters and shadows were sharp and geological features on the Mares (Tranquillitis and Nectaris) were easily seen. Earthshine was very prominent still especially in the eyepiece allowing you to faintly see features on the Moon well in shadow. Venus was resplendent bathed in reflected light which swam in the eyepiece as it got lower in the sky; the moving atmosphere and heat from local houses contributed to the multi-colour effect. The phase (84% illuminated) was clear like the Moon a few days before it is full. Keeping with the bright theme, the next object was our second planet of the evening, Jupiter. It was visible with Ganymede,Europa and Io to one side (the latter two quite close) and Callisto much further out on the other. Banding was clear but no Great Red Spot as it had rotated out of view by the time we observed. We returned to it several times throughout the evening. A new telescope had been brought along to the session by mum and son team; it was a Celestron AstroMaster 114EQ. So I dedicated myself to helping them get used to setting up and using it. The sightscope was of the laser spot version and had run had apparently run out of batteries so we used more traditional techniques of lining up the tube of the telescope at the object first and then carefully hunting around the area. The standard 10mm lens gave about 25 minutes view in the eyepiece so was ideal for hunting and locating objects. Although not first light, the scope spent a good amount of time observing both the Moon and Jupiter. Back at the bigger scopes, we tried to observe in sequence moving from close objects to far off galaxies to give a schmorgasbord for those newish to the eyepiece. We saw the colours of Albireo, the Ring Nebula M57, the Great Cluster in Hercules M13, the Whirlpool Galaxy M51 and Bode’s Nebula M81. Whilst not looking through the eyepiece, eyes were directed upwards and many satellites, aircraft and sporadic meteors were seen. 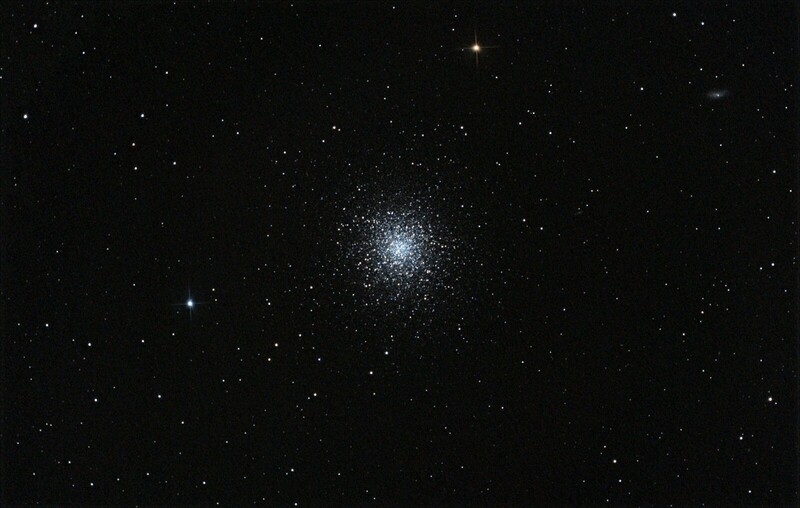 At 00:39, the IIS went overhead roughly from West to East passing close the the Globular Cluster M13 in Hercules. We rounded off the evening observing Saturn rising in the South. A lovely wobbly spectacle before heading off home at 01:30. Thanks to all that came along.